In this guide we’ll cover everything you need to know about sales – from what it’s all about and the tactics you might use, to how it all works and maximizing your results. Whether you’ve already dipped your toe in the water, or this is all new to you, you’ll find clear explanations and best practice advice that will set you well on your way towards a winning sales formula for your business. What is meant by the term B2B sales? B2B stands for ‘Business to Business’ and refers to companies who sell their products and services to other businesses, rather than to individuals. In contrast, B2C stands for ‘Business to Consumer’ and refers to companies who sell directly to members of the public. Examples of B2B organisations include those who provide services directly, such as software providers, legal consultants and accountants, but also companies who sell their products via a reseller. Most B2B sales transactions will be larger than those in B2C and will often have a longer and more complex sales process. A single consumer may, for example, buy one box of printer paper, while a large office buys 100 boxes at one time, and a retailer buys 1000+ boxes that they will sell on at a later date. A higher transactional value brings with it additional complications. A company that is targeting individual consumers only needs to convince one person to buy. A B2B organisation will usually need to convince multiple stakeholders, who are all involved in the purchasing decision and will have their own priorities. One statistic from The Corporate Executive Board suggests there are an average 6.8 stakeholders involved in any one B2B purchasing decision. In general, the more expensive or complicated a product is, the longer the sales process will be and the more people will need to be involved. This increase in time means the sales and marketing tactics used will usually differ greatly from those put to work in the B2C market. Many consumers will be sold to via their emotions and encouraged to make an impulse buying there and then. The additional time involved in B2B sales means that a much more rational approach is needed, which clearly lays out all the benefits and tackles any potential objections head on. B2C sellers will also cast their net wide, to draw in as many people as possible. With B2B sales, the best results will be achieved by focusing on a much smaller, more targeted audience. Different types of B2B buyers will also take different handling. Some buyers are very knowledgeable and will look to achieve the best deal available. They will ask lots of questions, do lots of research and generally take more time to consider the potential solutions and negotiate a better deal. For others, a single phone call may be all it takes for them to make up their mind about whether a supplier goes on their shortlist or not. Any good sales rep needs to be able to quickly adapt their pitch and strategy according to who they are speaking to and the cues they are receiving, or they risk losing out on the business. What’s the difference between B2B sales and B2B marketing? Whilst the end goal for both sales and marketing teams will be to increase revenue, the way the two teams operate will be very different. In an ideal world, the two teams will work closely together – marketing drawing in qualified leads, for sales to then close the deal. However, in reality things don’t always happen that smoothly. To understand why, we need to examine the differences between the two teams and where their priorities lie. Marketing is about long-term returns. Sowing seeds that may take a substantial amount of time to grow. In comparison, sales is about the present and asking the question: ‘How can I sell this product to this person right now?’. Marketing teams are focused on the bigger picture. They need to consider stakeholders across all levels of a prospective business, not just the end buyer. Every touchpoint in the decision making process needs their attention, to ensure the process runs effectively. In contrast, sales will concentrate on the final decision maker. Sales reps will also usually focus on a single product at a time – something they can sell to the person they’re talking to at that moment. Marketing on the other hand will cover the entire range of products on offer, looking for ways they might fulfil the needs of potential customers. While the two teams may have different priorities, when they work together the results can be incredible. Working in this way can help marketing gain a better understanding of the target customer base, so they can generate ideas that will draw more of the right type of people towards the business. Sales in turn can capitalize on this, by working with better quality leads, closing more deals faster and by feeding back to marketing what’s working and what’s not, to help strengthen the process even further. 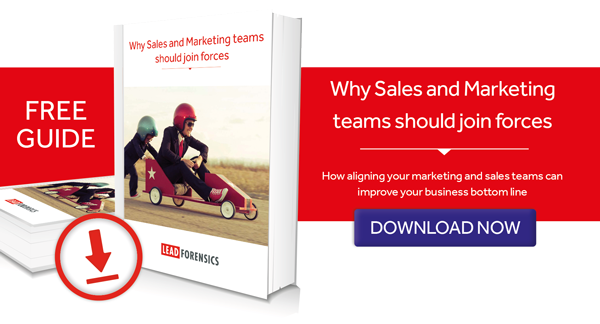 To get your sales and marketing teams working together more effectively, check out our blog: Smarketing: how to align your sales and marketing teams.